The FTSE made a modest decline of 0.05% as it ended virtually flat at 7421 on Wednesday. PM Theresa May managed to get an extension of the Brexit deadline until October 31 at yesterday’s EU summit however clarity on the UK’s manner of withdrawal from the EU remains uncertain as parliament has yet to reach consensus. In terms of data, UK’s GDP data and manufacturing production report came in better than expected aiding a lift in the pound thereby limiting gains on the FTSE. With no major economic releases due today, Brexit developments should continue to dictate sentiment. 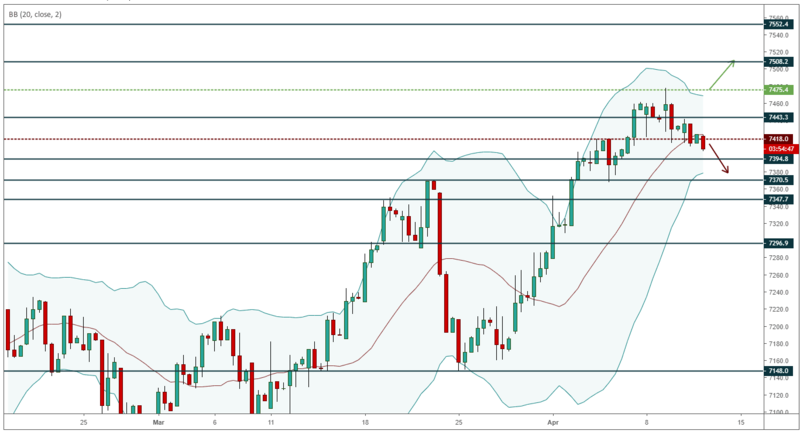 The FTSE’s uptrend remained on pause as the price failed to trade above the resistance at 7440 on Wednesday yet held above the support at 7420. The short-term outlook is neutral with a break through support at 7420 required to suggest a move to the downside towards support at 7370. Moreover, holding below the resistance at 7440 would indicate the presence of sellers and leave the FTSE ranging before taking on direction.